How could you walk away from that face for even a minute? It’s 10:01pm here. I’m in the basement. I’m in our office writing on my computer. As a busy new mom to a baby girl I should probably be showering or sleeping or brushing my teeth or working out…but I’m writing. I get an itch. An itch to write my thoughts and feelings and get them out of my head. It’s therapeutic and one of the things I credit for me sanity these days. …oh, but they’re so rewarding and full of joy. …but I’ve never felt so alive. …but I continue to strive to show kindness, empathy, compassion, and encouragement to my family. Right now I’m listening to the “Teen Party” mix on Spotify. I’m drinking out of a bright yellow cup. I threw on my floral matching pajamas. I wholeheartedly believe that what I surround myself makes a difference in my attitude and outlook on life. Bring on the bright colors. Bring on the fun teen beats. Isabella had a pretty good day. 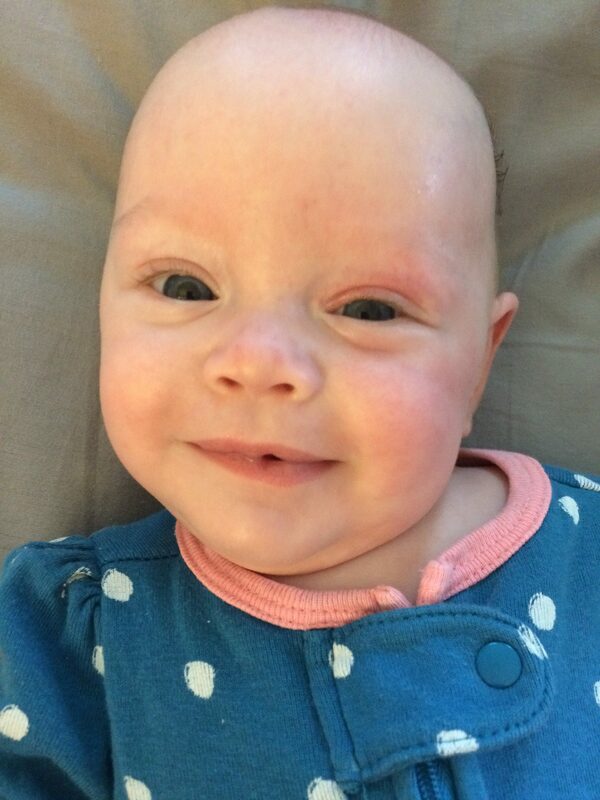 She’s adjusting to her new formula which is Alimentum and medication for her severe reflux. We had an appointment yesterday and she has gained an ounce a day since our last emergency appointment! This is very encouraging. We were referred to a GI specialist. That will be our next step in treating her stomach issues (Click here to learn more about why she’s having issues). She is still coughing, choking, and gagging, but she is doing it less. She still spits but not at every feed. We feel the prayers and God has been leading us to solutions. Praise Him! It’s looking worse, but we are going to Akron Children’s on Monday. Her pediatric dermatologist was amazing and called us today and ordered the new medication so that we could begin treatment on Monday. We will pick it up and bring it to his office with us. This is very nice because we were only going to go over her liver ultrasound results and talk about her care plan. We typically would have to come back to have him give her the first dose and monitor her. Since we live an hour and twenty minutes away and have a bunch of other appointments, he offered to begin it on Monday. She will be given propranolol at his office and will stay there for an hour and a half to two hours to be monitored. After that we will come back a week later to adjust the dosage. From there we only need to see him once a month to adjust the dose based on her weight. I’m relieved she doesn’t need to be admitted. I’m also relieved we won’t need to travel to Akron every week! 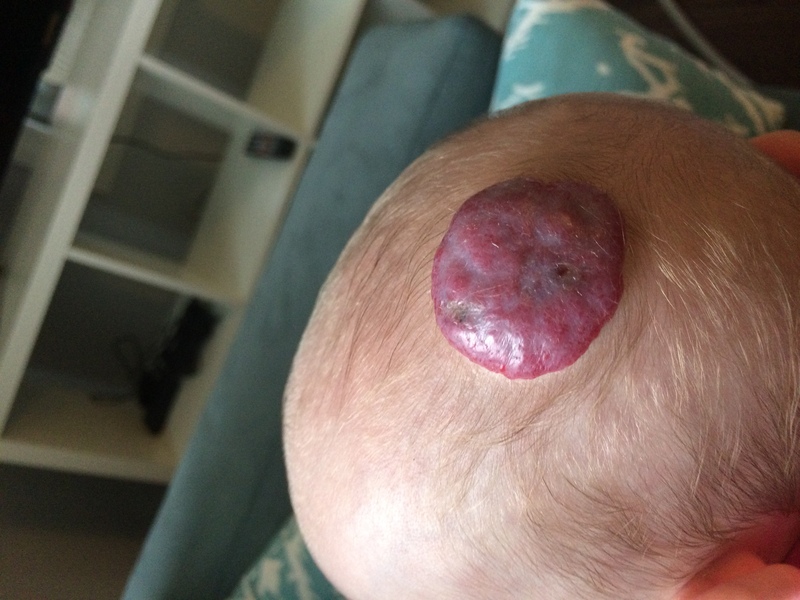 This medication will work to shrink blood vessels and will assist in shrinking her hemangioma, which is a vascular birthmark on her head. We hadn’t originally wanted to treat it, since it was only cosmetic, but as time went on it became a health concern. Click here to learn more about it and why we’re treating it! There are so many other things to write about and update. Bella is fed every 3 hours and Dustin and I take shifts. Her feed is hung by gravity currently and drips like an IV into her tummy. It takes about 50 minutes for 65ml to go in. We hold her during her feed. Then we have to continue holding her in an upright position. This takes a lot of time! It’s also a great time to bond with our cute lil one. We love cuddling. She typically falls asleep during her feeds. With her on my chest I browse Pinterest, Facebook, read blogs, and research things regarding her health. I see it’s almost time for her to eat again so I must run up to assist Dustin in her care. It’s Not A Bad Day…It’s a Day with Bad Things In It. Today was difficult. 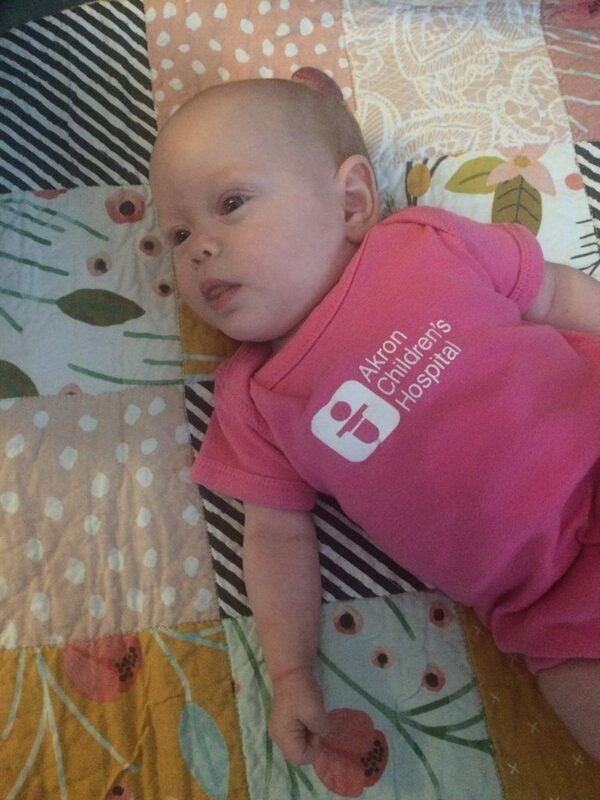 Since being home from the NICU we haven’t been so scared that Isabella would need to be sent back to Akron Children’s Hospital. Lately she’s been spitting a lot after almost every feed and cries out in pain. We’ve known she has reflux, but were advised against treating it since she was doing OK and not spitting much…until more recently. After last week meeting with Speech Therapy and Nutrition, they noted she was hoarse and her esophagus could be getting burned so we should begin treating it. 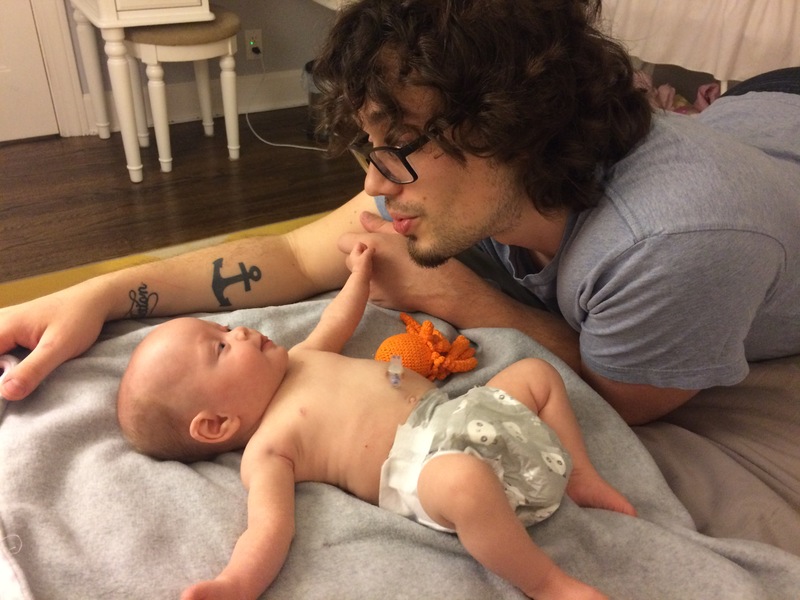 We got in the same day with our Pediatrician and began Zantac. We also ordered a pump for her gtube feeds, hoping that would help. Since then things have gotten worse. The Zantac made her struggle to go number two and seemed to increase the spitting. We stopped it and made an appointment for Friday. We didn’t know it would get to the point where she’s spitting up almost her entire feed and crying/screaming out in pain while being fed through her tube. She shows all the classic signs of reflux. The formula comes up through her nose, she burps it up, and she is coughing a lot. This afternoon I couldn’t bring myself to continue her feed because she was in agony. I’d stop it and restart it. She has to eat! 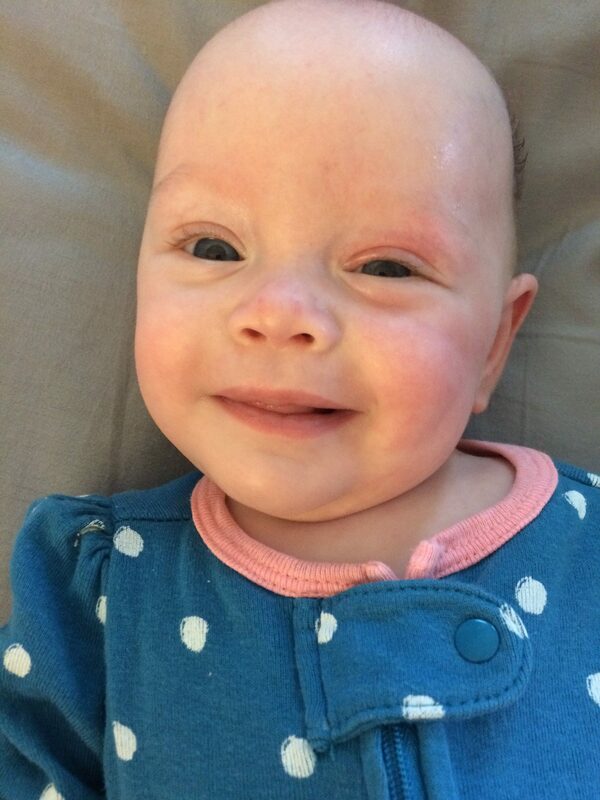 She’s been labeled as Failure to Thrive once before so this is very scary for us. I called right away and got an appointment this afternoon. Sadly, she had only gained about one ounce since July 11th (6 days ago) and she’s supposed to be gaining an ounce per day. We strategized and decided to try Prilosec and Neosure Alimentum, a specific formula that may help. (In the NICU we tried this formula for a few days but saw no progress). Since we’ve been home tonight she’s only had a slight spit, slept through one feed with minimal crying, and cried through the other feed. It’s improvement. I’ll take it. Why Is She Getting Worse? 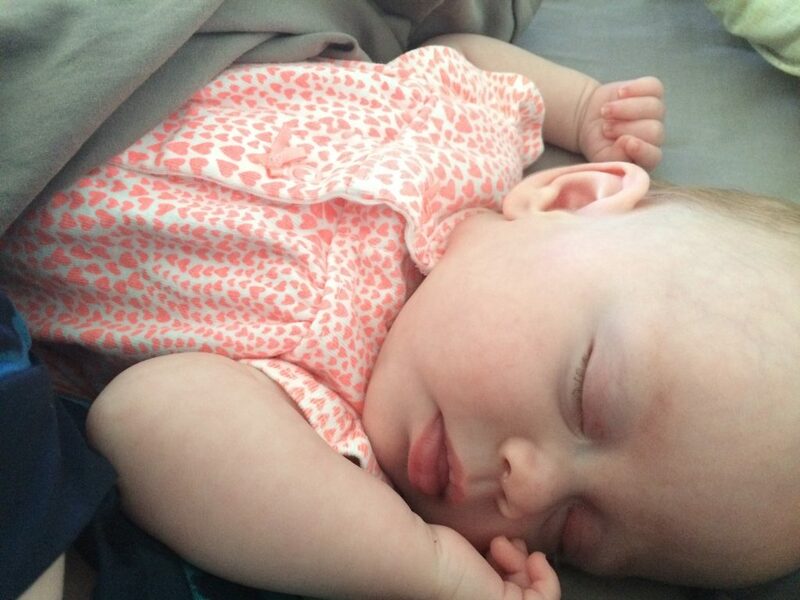 We aren’t 100% sure why her reflux has taken such a dramatic turn but we have a few ideas. 1.) When she had her gtube surgery her stomach was moved. The Neonatologist had warned us this could cause reflux since the position of the stomach is different. 2.) 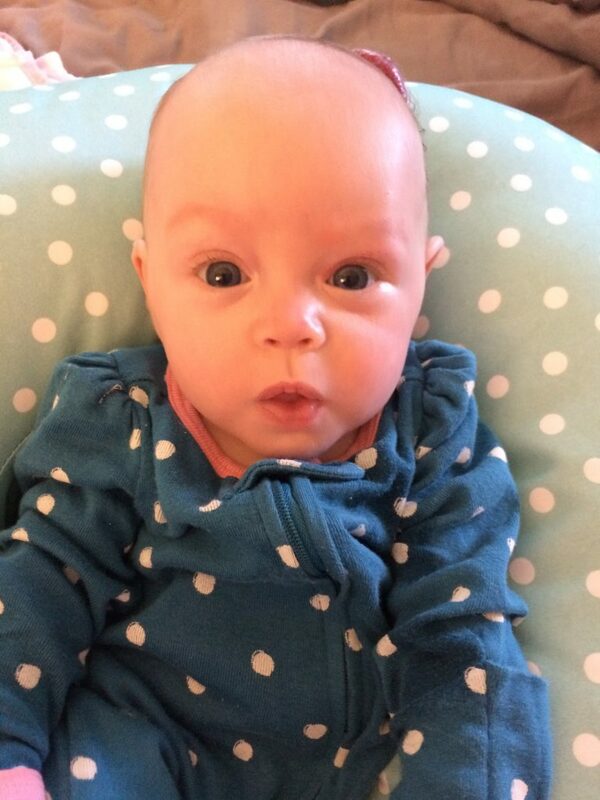 Babies can “grow” into reflux. I’m not sure why, but it’s something that you see between 3-5 months we were told. Why Is This Such A Scary Thing? Isabella was a micropreemie and needs to grow. 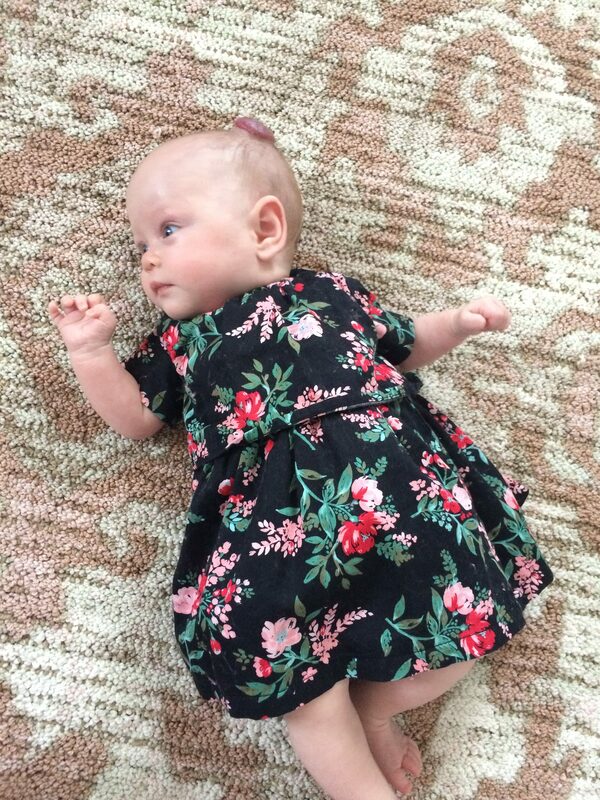 She is less than 1% in weight than the rest of those her age. 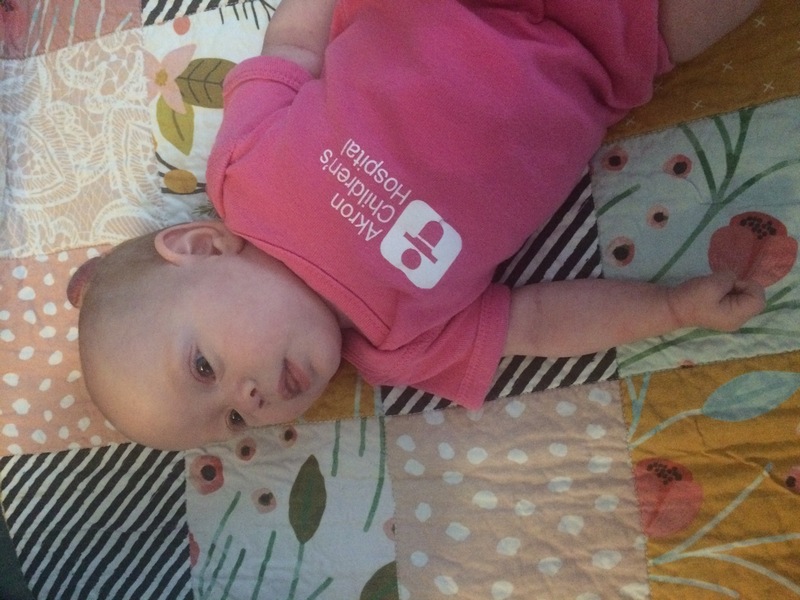 Refusing to eat caused her to be readmitted into the NICU for another month. We later learned she silently aspirates (liquid goes into her lungs) when she eats. This has caused her to be extremely averted to bottles and most things orally. With her spitting up, we are concerned she could be aspirating that liquid. We have no way of knowing if it’s going into her lungs. 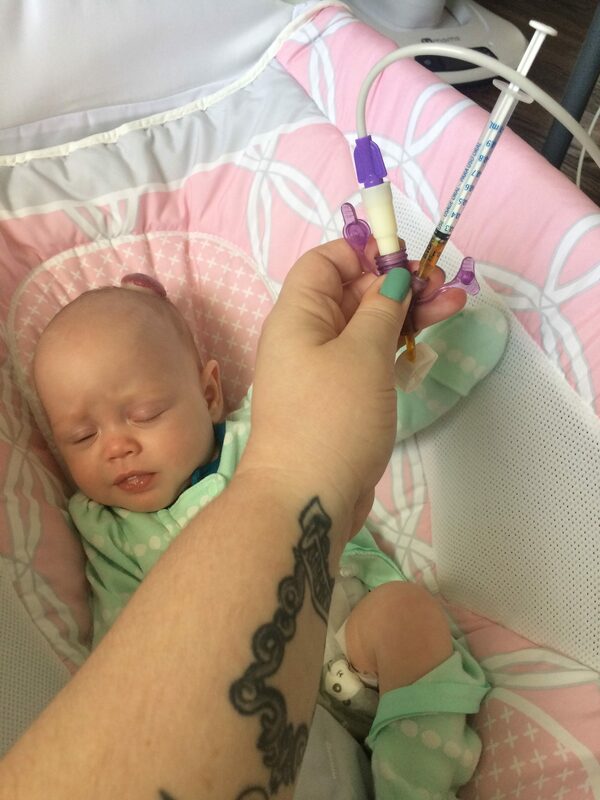 Without keeping her formula down she could also lose weight, which is super scary for a baby already in the less than 1% for weight. This could lead her to be readmitted to the hospital. Please pray that she stops spitting and begins tolerating feeds and isn’t in pain. 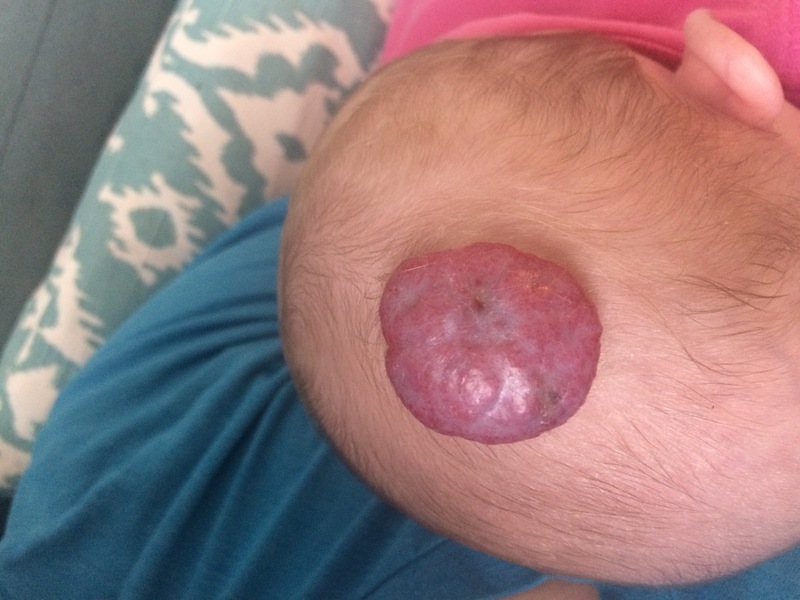 On top of the reflux, which was the most critical issue we were facing today, Isabella’s hemangioma (birthmark on her scalp) began to show signs of ulceration (skin breakdown). I had noticed a few dark spots and after some research learned that the large blood vessel filled mark could ulcerate and breakdown. It can also get infected. I sent off some images to our pediatric dermatologist and he called back, confirming it was beginning to ulcerate. We were given the option of taking her to Akron tomorrow but we felt it was best to wait a few days since she’d been through so much and we are beginning a new formula and medicine today. He said that was OK and ordered a topical antibiotic to apply. We aren’t to use our fingers but a Qtip. Well, I kiss her all over her head and stoke her head and most certainly touch it, so I’ll need to be more careful and use more sanitizer. We are also going to be treating the birthmark with medicine to make it shrink. 2 months ago we met with him and decided against treating it since it seemed as if it would go down and she only had one. It was only cosmetic and that was confirmed with an MRI. Now, she has 3 more and there’s concern for internal ones. So, for our next appointment we will begin a blood pressure medication to shrink it and the others. She will also have a liver ultrasound to rule out any internal ones. My heart is super sad, but thankful we have access to medical professionals. Our dads both came over and brought goodies. Doug brought homemade pie, veggies from his garden, and chocolate zucchini bread. My dad ordered us Papa Johns, enough for tonight and tomorrow. They held Bella while I tried to get a grip on everything. 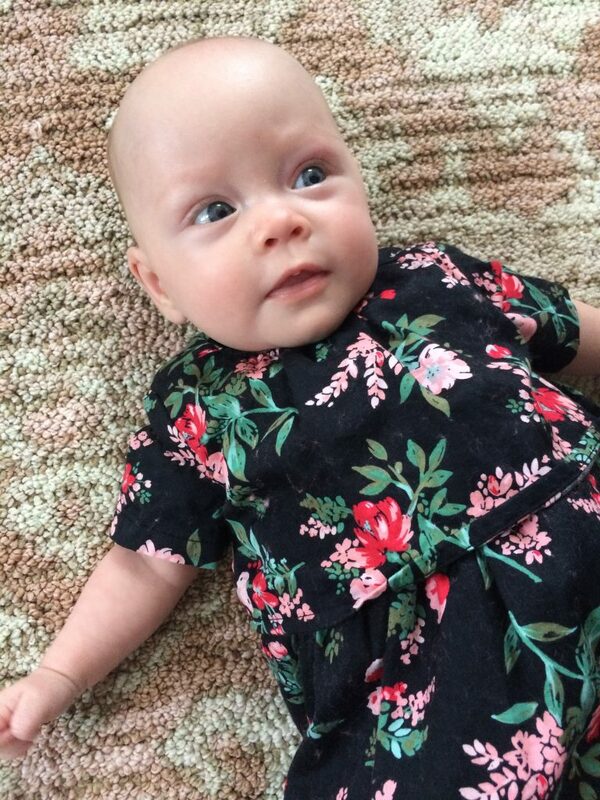 Tomorrow we meet with Help Me Grow at home for her assessment for physical therapy and pediatric development. I’m praying it’s a better day and she’s not in pain. Thank you all for following our journey and loving us well. Please pray tonight goes well.